A few years ago, I remember actress Pooja Bedi chortling on the phone about how she had bearded the lion in his lair -- she had interviewed Bachchan for a television channel (the interview was shelved eventually) and got his goatee. I found myself defending Bachchan rather earnestly. I reasoned with Pooja in my Sunday sermon tone that she must have caught him on the wrong foot. Pooja vociferously overruled my opinion. However, while chatting to me recently, she casually mentioned that she had met Bachchan at Mumbai's The Club a few days ago. Like her, he was using the treadmill and apparently does so regularly to keep fit, and they had exchanged broad smiles and small pleasantries. The Bachchan may not be easy to befriend; but it is even more difficult to provoke him into acknowledging you as his foe. So after having done around a dozen articles with the man, I too have sometimes been irked by the actor; especially when I have been at the receiving end of monosyllabic replies and on the rare occasion have even been compelled to scrap a couple of interviews as I found them lacking bite. But this has been amply compensated by Amitabh's unfailing politeness, his willingness to walk the extra yard for you, and of course a journalist's biggest joyride -- his genuinely in-depth interviews. I met him recently at the screening of Ram Gopal Varma's Road at Mumbai's Film City preview theatre. We were barely 15 of us. The show was scheduled to begin at 9 pm. Bachchan arrived on the dot, without much fuss and ado. Wearing a white kurta half concealed by a shawl, the bestubbled Bachchan looking just a shade gaunt, sat plumb in the middle of the last row. Alone. I was meeting him after some time. When I approached him in the interval, he arose from his seat as I neared him to welcome me. This is not a rare gesture between people who know each other. But very few star-actors display such common courtesies. Amitabh is that rare class act who does. To everybody. Amitabh's amiable avatar on Kaun Banega Crorepati might may have caught people by surprise but it was always real -- or at least as real as his emotional barricading of his inner self when he chooses to do so. I remember at Madhuri Dixit's big birthday bash (the only party she threw), while my colleague, shutterbug Rakesh Shrestha and I stood at the bar, nursing a Bacardi and an orange juice respectively, Amitabh walked up to us to extend a hand to say hello. Shah Rukh Khan is probably the only other actor who has the confidence to reach out without waiting to be acknowledged first. 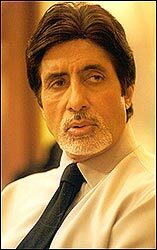 Also, thankfully, despite being much older than me, Bachchan does not bristle with indignation because I don't attach a ji to his name. Like Dev (Anand), he is cool being called Amitabh. My association with Amitabh dates back 13 years. I met him for the first time at Mumbai's Chandivli Studios where he was shooting for Ajooba. Bachchan had just lifted his long ban on the film press. I was impressed by his gift of the gab and jab(s). Candour, courtesy and commonsense distinguished his conversation. He used film magazines as a platform to clear his name in the Bofors controversy but to give the man his due, he spoke honestly about all questions addressed to him, including how Yash Chopra made him a party to convince (wife) Jaya and (actress) Rekha to be part of the cast of Silsila. He called back after the interview was published, giving my secretary, who answered the phone first, something to rave about for the next week. Obtusely or deliberately, stars have selective memory lapses. But at the Hum premiere in Delhi, Amitabh painstakingly and unerringly introduced each press member to the then prime minister. Over the years that I have known Amitabh, he has always enjoyed the company of people. Once he is comfortable with a person, he does let his defenses, and hair, down. After flying down an entourage of editors to Kolkata to attend the premiere of Agneepath Amitabh organised an impromptu bash in his suite. Even those who had changed into their pajamas were asked to come, as is. We lay siege on whatever place we could squat on. Champagne bottles dunked in ice buckets and snacks made rounds while the air conditioner struggled to keep the cool air circulating. Yash Johar, Romesh Sharma and Archana Puran Singh were part of the audience held captive by Amitabh's recitation of Harivansh Rai's recitation of Madhushala. Jokes, stories and shayari followed. At four am, when we staggered out of the room, a poker-faced Bachchan asked, "Are you sure you don't want to stay for some more time?" It set me thinking, were stories of his being an insomniac indeed true? If pajamas were the designated outift at the impromptu bash, a full suit was the dress code at his 50th birthday. The party was a huge hit. It has been ten years since, but I still remember Saif Ali Khan, Amrita Singh, Neelam and an animated Amitabh croaking on the karaoke. Waiters carrying trays of pink champagne refilled the glasses of socialites, stars and singers, and wife Jaya attended to each guest. Ever since his parents have been ailing, the Bachchans have stopped holding their annual Holi bash. Until a few years ago, Jaya and Amitabh would invariably have a Holi party and receive each guest by applying a gulal ka teeka. The Bachchans are loyal to their friends as evidenced in the regular faces that I saw in the succession of Holis that I attended at his bungalow. While Abhishek leads the dunk karo brigade, Amitabh is the magnetic centre: he dances without a care in the world, does his best Bhagwandada imitations and enthuses the band-baajawalas to play with more gusto. On rare occasions I have been a bemused spectator of Amitabh's icy side. It is not easy to get him to do what he doesn't want to do. Our lensman was shooting pictures of Amitabh-Jaya for a magazine cover shoot. After exposing a roll, the lensman wanted Amitabh and Jaya to change outfits. Jaya obliged, Amitabh refused. Outright. Reluctantly, he agreed to drape a black shawl over his white kurta-pyjama to lend a semblance of difference to the second set of pictures. Fortunately, there is a certain sensibilty which overrides the unbridled egotism common to many stars. When I decided to bring warring rivals, Rajesh Khanna and Amitabh, together after 17 years for a joint interview and cover, Amitabh let Khanna, the senior actor, decide the date and location of the session. The import of this is something only one who has juggled star egos for photosessions will appreciate. At the session, Amitabh was a little standoffish initially, but Khanna's charm (he was patience personified), French wine and a shift to a suite thawed Bachchan, and paved the way for much boisterousness and bonhomie. Invited to preside over the launch of my book, The 100 Luminaries Of Hindi Cinema, Amitabh arrived a good ten minutes before the scheduled 5 pm. He ribbed me about being late while I reminded him that he was early. While his modesty can get one's goat ("I am not a superstar", "I am just a part of KBC"), his accessibility is something he can deservedly gloat about. Once, when he called me at my residence, my mother picked up the phone. When Amitabh introduced himself in his unmistakable baritone, my mother pointedly asked, "I have heard a lot about you from my son. But I want to know what you think of my son!' I don't know what Bachchan said to that (and now I shall never know) but my mother held him in high esteem till her last days. Behind the dignified front is also a vital, childlike enthusiasm that has survived and, I suspect, keeps Amitabh going. I recall speaking to Amitabh long-distance to America once. The Movie (magazine) Opinion Poll results had just been computed. Amitabh had been adjudged the most popular actor, leading even the new Turks by a wide margin. When Bachchan heard this, he was audibly thrilled. He insisted I fax him the results -- not just the result pertaining to the best actor --- but the entire poll results comprising 40 questions and answers in all! Amitabh Bachchan now turns 60. I am happy I met the man.